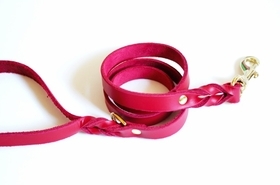 This beautiful red leash is handmade using high quality Latigo leather. Strong, durable, it's hand-braided at both the snap hook and handle ends and reinforced with brass hardware. A ring is attached just below the handle offering a variety of uses like carrying poop bags or clipping into a shoulder loop. Available in 5/8" and 3/4" widths, and various lengths. Choose from gold or silver hardware finish, bolt or trigger snap hooks.